what is the R value of this product? I have a crawl space that is like a rain forest right now. It is so humid and damp in there it is disgusting. Something definitely needs to be done. I think there is a leak somewhere. 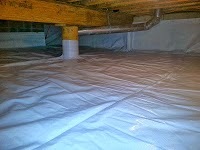 I didn't realize that waterproofing your crawl space can lead to energy savings. Sounds like a win-win to me. I will get someone on that asap.